Take lightning safety into your own hands with the world’s first convenient, dependable and easy-to-use personal lightning detector. StrikeAlert is a small and affordable lightning detector that provides an early warning of approaching lightning strikes from as far away as 40 miles, and lets you know if the storm is coming your way. An audible alarm sounds when there's a strike and a corresponding LED light illuminates accordingly at lightning distances of 20-40 miles, 12-24 miles, 6-12 miles and within 6 miles. 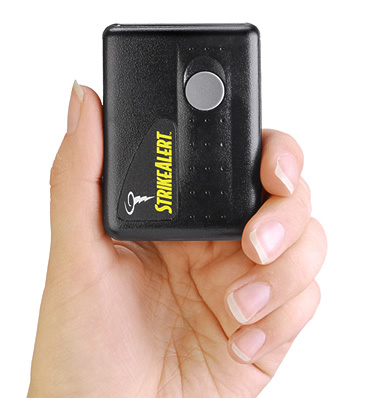 The detector is housed in a small pager-like casing that can be clipped on a belt loop and runs on a two AAA batteries. Small and impact-resistant, StrikeAlert clips to your belt, golf bag or backpack. With press of a button, you can see the lightning strike distance, track the storm direction and view battery life. The power button is used to select “On”, “On with tone”, and “Off”. Turning the unit on requires simply a short pressing of the button. Pressing the button for approximately two seconds upon power-up enables the tone (a beep will sound indicating that the tone has been enabled). When wanting to turn the unit off, simply hold the power button down for approximately four seconds (again, a beep will sound indicating that the unit has shut off). During normal operation, the green LED will be on continuously to indicate StrikeAlert is monitoring for lightning strikes. If the green LED is blinking, StrikeAlert is in the presence of interference (see below for more information). When a lightning strike is detected, StrikeAlert will light the appropriate LED indicating the distance of the strike. This LED will remain lit for two minutes, unless another strike occurs during that time. If a more recent strike is farther away, the LED indicating this distance will light for two seconds, and then return to complete the two minutes from the nearest strike. If a more recent strike is nearer, it will replace the previous LED reading. This LED indicator will be held for two minutes. This allows the user to see all the lightning activity within a 40 mile range, giving clearer visibility to the nearest strike in the last two minutes. If the power switch is in the “On with Tone” position, StrikeAlert will also generate tone(s) indicating the distance of the strike along with lighting the appropriate LED. This allows you to determine the storm's activity without having to monitor the LEDs. If the LED cycles from the center LED to the outside LEDs, the storm is stationary or there’s not enough data to determine the direction of the storm. Direction cannot be determined if there has not been enough strikes to identify a trend or StrikeAlert has not been running long enough. Approximately five minutes is needed in the presence of lightning strikes to determine direction.